A short exposure of Messier 10 in Ophiuchus, 14,000 light years away, provides a look into the dense core of a modest globular cluster. 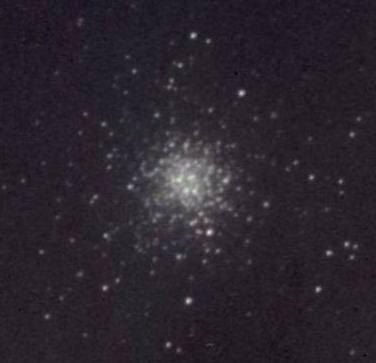 Of the three presented here (Messier 13 and Messier 15), it is the smallest, containing about 150,000 solar masses within a volume 50 light years across. Like all globulars, it is old (typically 12 billion or so years) and poor in metals, with a ratio of iron to hydrogen just 3 percent solar. University of Illinois Prairie Observatory. See M 10 in the labelled image of Ophiuchus.